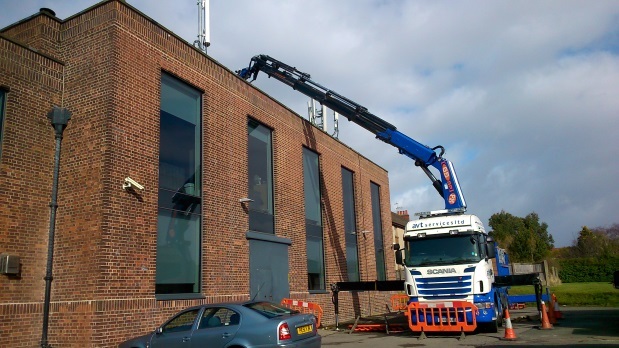 As the company grew and it became clear that we needed to control more of our operations, over 10 years ago we invested in, at that time, a large lorry mounted crane. This has allowed us to ensure timely delivery and removal of materials and plant to and from our worksites throughout the UK. This was subsequently upgraded and joined by our latest addition, a state of the art high capacity machine fitted with extension fly jib, giving spectacular lift and reach capabilities. High lift and long reach are our speciality, with a maximum 30m height and 26m outreach, with the ability to lift almost 1 tonne at full reach, or up to 5 tonnes at a useful 10m, the fly jib enables us to reach vertically 20m and horizontally 15m, This machine allows us to replace a traditional crane in many scenarios passing a significant cost saving to the client. We are Members of ALLMI, which ensures that we uphold the highest standards of training and safe working. These machines are available for hire for lifting and transport and we can offer a full lift planning service and supply slinger banksmen to ensure fully compliant working systems. We have available a drawbar low loader trailer allowing all manner of plant and materials to be transported and delivered, often being lifted into difficult to access sites. We offer a full logistics service with a range of smaller vehicles with tail lifts and 4×4 with trailers and have experience delivering to all site types.